As I have said many times before, I am a very busy wife and mother. Most of the time, my children are either in the process of making a mess or I am cleaning up a mess. It is a never ending battle that I have surrendered to never winning. :) Probably the worst mess (and I have had some doozies...) I have had to clean up was when my 3 year old was drinking a blueberry banana smoothie. He accidentally dropped the GLASS glass that it was in and it shattered all over the floor. The smoothie that was in the cup, splattered over everything. The walls, the ceiling, the floors, the dining room table and chairs...it was everywhere. I couldn't be mad, it was an accident. However, it was quite a large clean up process but since I tackled it immediately, the blueberries didn't stain any of the surfaces. Whew! NatureZway™ brand provides ECO-FRIENDLY cleaning products that are produced from RENEWABLE & SUSTAINABLE materials. Our products must offer best value & SUPERIOR functionality. These products after disposal will BIODEGRADE with no or minimal harm to the earth. 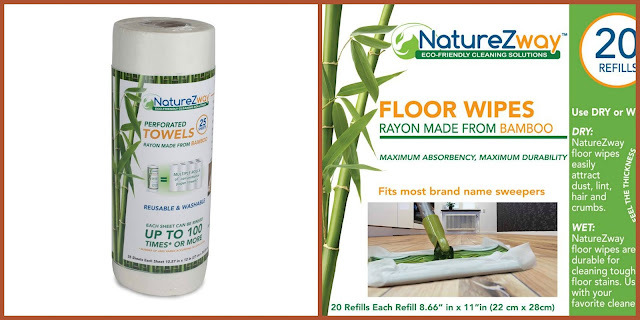 Bamboo is from the Grass family and easily renewable. Fast Growing and matures in only 3 years. Takes up less land space. Uses less water than trees. Requires Zero pesticides to grow. Reduces greenhouse gases and captures more CO2 from the atmosphere than trees or cotton. I definitely learned a few things when I read all of that. I had no idea that Bamboo was such a versatile thing! These towels are soft in feel, and are almost cloth-like in their texture. 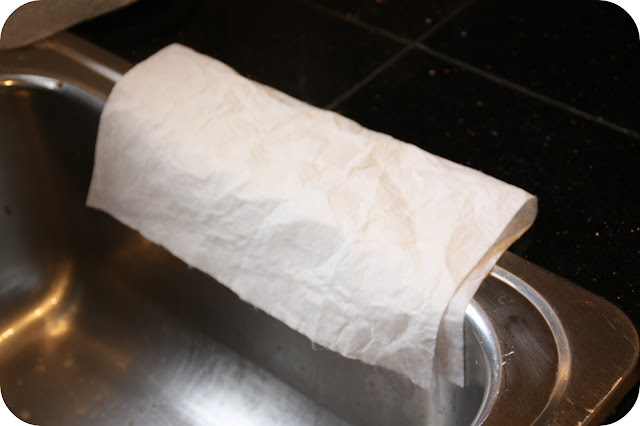 They are thick and absorbent, and can be rinsed and re-used up to 100 times. The messes I encounter might shorten that number a bit but it is nice to know that I can use them alot before tossing them out. I found that the towels picked up alot of the grime and dirt off my counter tops and that they were the perfect size for wiping down my counters. They are perforated so they tear apart easily, no fussing and struggling with them ripping into less than desirable sizes. The best part is that they are easy to rinse out and once they dry out, they can be used again and again! Now, I will admit...I don't have alot of space around my sinks for drying towels. My space is limited so I use these a few times and toss them out. Plus, I worry about the spread of germs by cleaning and re-cleaning with the same towel. So, hand rinsing after mild usage and reusing several times seems to work best for me. 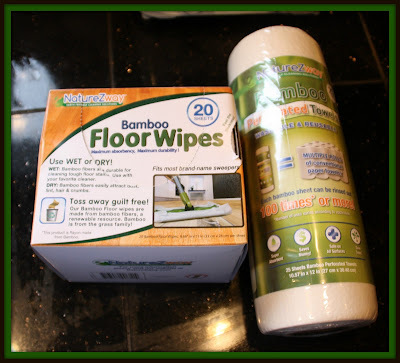 The floor wipes can be used wet or dry and are attachable to most brand name sweepers. I don't own any of those types of sweepers so I just use these in my hands to wipe up spills and messes on my floors. They are quite handy to have around too! Again, they are made of Bamboo and are very eco friendly. You can find these two products from NatureZway at Target and also online. The towels retail for approx. $6.99 and the floor wipes retail for approx. $12.99 for a box of wipes. All in all, I am pleased with these products from NatureZway. I would recommend them to anyone who is Eco-conscience and who is trying to be mindful of the environment. They are handy, durable and work great for busy moms like me who are constantly cleaning! Be sure to check out NatureZway on Facebook and also on Twitter...they would love to see you stop in! 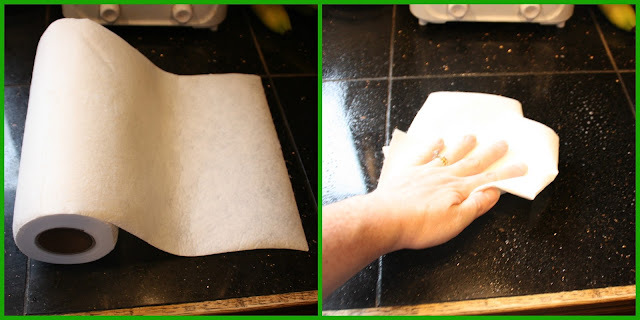 I love the idea of a "paper" towel that can be rinsed and reused so many times.